So last week my hard drive stopped working right before the deadline for my semantics/pragmatics paper. I was able to get an extension, but “I had computer troubles” is the “dog ate my homework” excuse of the modern age, so, conscientious student that I am, I felt the need to get documented “proof” of my computer troubles. I had the computer shop that fixed my hard drive write up a note and put the company seal on it. Anyway, I thought I’d share it because I kind of enjoy the challenge of reading handwritten Chinese. This note isn’t too difficult to read, although a little challenging in parts. If you want help deciphering, though, click through to the Flickr page. > Pan Ji‘s teacher: Hello. > data could not be read. The only thing I’m confused about is the character before the 8号 at the bottom. It looks like 「し」. Is it a lazy man’s 自, or did the author just use 到 instead of 至? It’s an open-parentheses, I believe. Oh, right…. didn’t notice the corresponding parentheses on the other side. Doh! It has the added authority of being on “awesome” paper. Is this the computer you were so proud you got for cheap? Oh, “潘吉老师” is kinda ambiguity, John. It could mean a) Teacher/Mr. John, b)John’s Teacher, and to a native Chinese speaker, he/she will naturally pick the first meaning, which makes the note look like someone else left to YOU exactly (and he calls you Mr. John). I agree with kastner. 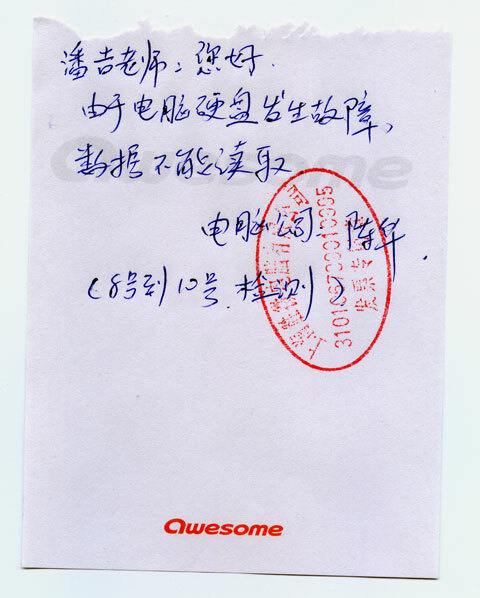 Most Chinese will think that the note is for Teacher 潘吉. The note may be ambiguous when taken in isolation, but I dictated the content of the note, so I know what it’s supposed to mean. The computer guy chose the specific language used, but the note was definitely addressed to my teacher. hehe you’re right, i said i’m “nitpick” in this case. Your teacher surely could understand what happened without you explaining it. But the first impression he makes, i guess, is that someone left YOU this note and afterwards you show it to him, cause when we say 某老师 we mean HIM not his teacher, otherwise we add “的”, so for example 张恒老师/张恒的老师 indicates to two different persons. I love that you can write on anything in China and the stamp makes it all legit! Even though counterfeit stamps are so easily obtained. I agree that the teacher will understand that it doesn’t say ‘teacher Pan Ji’, as he knows that you are Pan Ji and he is the teacher, but without this context I would have thought it said ‘teacher Pan Ji’. I’m not a native speaker, but have never seen ‘Pan Ji laoshi’ to mean ‘Pan Ji de laoshi’. Why are you all discussing this? You should all be stuck speechless at the part where John has been culturalized (might have just made that word up) to feel the need as a student, A GRAD STUDENT!!! !, to get a note from a third party so his prof would believe him that his computer died. Unless a paper needs to be finished in time to submit to a journal or conference or some such, strict deadlines do not need to exist in grad school. Academia in this country baffles me and makes me very afraid for the future. Yes! You got the point. Also, the note is kinda funny in a subtle way. Yeah, I think it worked. It dosen’s work, bad student. I will subtract 50 from your total mark.